At the back of the property is The Oak Terrace, shaded by a stand of live oak trees. This private outdoor space is a perfect place to have a summer or fall gathering. It can also be used in conjunction with other areas for you event. Our central plaza is another gathering place for visitors wanting a larger venue for their event. This private walled garden with over an acre of landscaping is a beautiful place to host an outdoor gathering. We have a Dove Aviary, formal rose garden, pond and game area. For smaller gatherings under 25 people, our central courtyard with outdoor seating surrounded by plastered walls and a fountain can offer a more intimate environment for your group. The Brambles was once a spiritual retreat and camp area back in the day. The Camp Pavilion with it’s semicircular design is situated in a clearing in the woods and is a perfect place for a wedding or celebration. It can also be utilized for workshops, business retreats and family reunions. 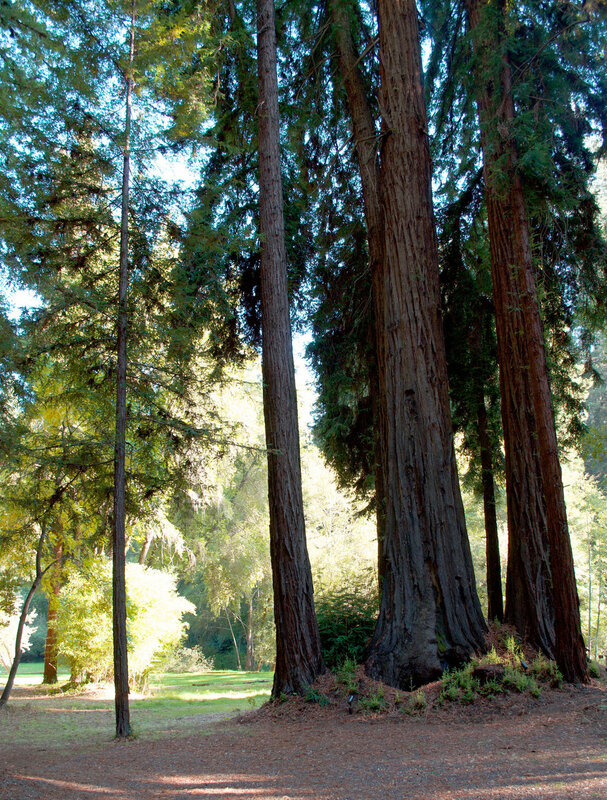 Celebrate in a grove of majestic ancient redwoods at our Brambles property. The setting is magical, quiet, tucked away and is boarded by Indian Creek. It can easily accommodate smaller groups as well as larger gatherings.